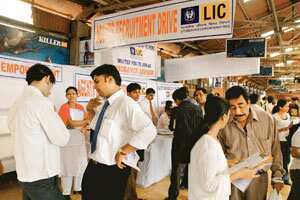 Fair play: An LIC stall at Dadar railway station in Mumbai to recruit agents as insurance advisers. Agents often hype the returns or safety of the policies they are pitching to unsuspecting clients. Facing increasing complaints about tall claims by insurance agents in selling policies, more companies are increasing their tabs on them. “Sometimes we give a false lead to our agents to measure their punctuality and quality of service they offer to customers," said Rajesh Sud, executive director-distributor, Max New York Life Insurance Co. Ltd. “Apart from sending ghost customers to our own agents, we sometimes send them to our competitors, too." Agents often hype the returns or safety of the policies they are pitching to unsuspecting clients. One pamphlet of Money Plus Plan of Life Insurance Corp. of India (LIC) from an agent claimed that if you invest Rs10,000 for an initial three years of taking the policy and then roll it over for 20 years, you would get Rs16 lakh at the end of the term. “To curb mis-selling of products, mystery shopping is a common practice among insurance companies," said U.S. Roy, managing director and chief executive, SBI Life Insurance Co. Ltd.
“Apart from mystery shopping, we also have different audit teams who frequently visit customers and take their feedback. These audit teams give us feedback about the quality of services offered by our agents and how satisfied are our customers with the products?sold?to?them,"?he?said. If agents’ services are not satisfactory, companies can spread the word, for instance, they can forward the names of the suspect representatives to the Life Insurance Council. “We report the agents to the organization so that people can know about the antecedents and credibility of an agent," said Sud. According to National Consumer Disputes Redressal Commission (NCDRC) figures, the commission receives the maximum number of complaints against insurance companies for refusing claims and poor problem-solving mechanisms. “Insurance companies are keen to enrol consumers, but when it comes to claims, policies are rejected after undue delay," said Rajyalakshmi Rao, member, NCDRC. “Ghost customers is one of the ways to keep a check on our advisers. We, however, depend more on divided sales process of the company," said Pranav Mishra, senior vice-president and head of products at ICICI Prudential Life Insurance Co Ltd.
“Under divided sales process, the whole process is divided into three steps. The first step ensures that an adviser has shown illustrations with moderate returns, which are in return signed by policyholders. The second step ensures all policyholders, with premium income of more than Rs1 lakh, get a welcome call. At the third stage, we have introduced one-page document of key features in addition to brochures giving details of the product," Mishra added.